You are a practitioner of Working Out Loud what benefits have you seen in organisations? Working in a previous organisation, a global pharma company, initially our successful Yammer network was tracked only by adoption metrics by IT. After a few years exposure to Lean practices at the same time the Yammer network was growing, I realised there had to be ways to measure real business benefits. Yammer groups made parts of the businesses more “responsive” e.g., decreased email trails (lean would describe this as a wasteful way of working!) and increased collaboration by working across internal businesses, time zones and geographical boundaries — enabled by using powerful Yammer translate functionality. I loved nothing better than co-creating Japanese, Russian or Spanish Yammer conversations reaching out to colleagues they never knew existed that could help move their work along. I found this very rewarding but also good fun! How does your model help organisations work out loud? It helps to align business strategies and projects, share business improvement and knowledge networking stories about WHAT you do. Demonstrate the right behaviours and values on HOW you do it – creating what I like to call “digital internal DNA”. Decreases email dependency, and also demonstrates how enterprise business tools might be embedded in mobile apps, processes and systems. To be honest, this is a lot of future thinking that needs more explanation and discussion. Can you describe what you call “business intelligent #hash tags”? These are simply hashtags inside a company that enable searching and data mining strategic content. Cultural buzzwords all companies have internally – the model below shows examples. They help to share knowledge networking stories, cultural sentiments and capture meaningful, actionable tacit insights. 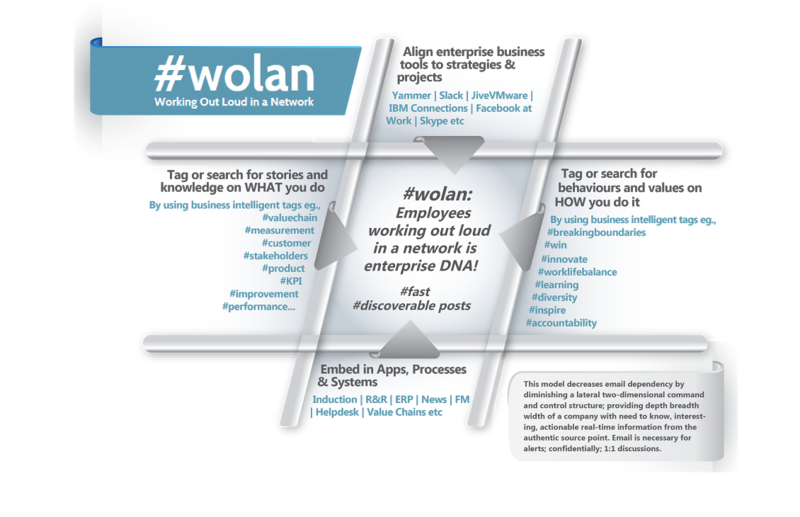 Enables working out loud in a network, creating a positive but a somewhat disruptive flow – working up, and out of silos. However, word of warning… hashtag appropriately or they end up meaningless. What do you recommend people do to see the benefits of working out loud? Firstly, stop creating random email trees! Get people sharing and collaborating on strategy and projects in the network – there are many vendors to choose from now all offering something slightly different nuances. I am vendor agnostic! Encourage public groups for enterprise serendipity but perhaps start with a private group to get the team comfortable and then make it public when it’s up and running and then crowd source more interest. To get momentum behind working out loud you will need golden qualitative stories of business value to help whet peoples appetites and for it to start making sense in their own part of the business – stories that are speaking their own language. I found in my former company that to share an R&D story in Manufacturing did not get any interest you had to share a story about their own business for it to resonate. Same with sharing external insights, has to be like for like. These stories will unearth the real champions who worked with a passion to get the groups going. I’ve developed a set of standard simple questions to capture the business value on a page and will always ask a senior leader to quote on the business value they attained by using Yammer in their team for the story too. These stories can also be shared further in the business by comms on the intranet. I have about 10 examples of these golden stories that I will shortly be sharing in blogs, from R&D, manufacturing, sales, marketing, fundraising, induction and communities of practice. This thinking needs explanation and discussion, and that is why I now run half day workshops on #wolan. We also offer a wide range of evidence-based engagement techniques to support enterprise business tools for beginners, intermediates and advocates to support business strategies and new opportunities.